#270 (9 Nov) to Metz, #271 (10 Nov) to Cologne, #272 (11 Nov) to Gelsenkirchen, #273 (16 Nov) to Weisweiler, #274 (20 Nov) to Gelsenkirchen and #275 (21 Nov) to Merseburg. #275, 21 Nov 1944, to Merseburg, Germany in B-17G 44-6309 Duchess' Granddaughter (359BS) BN-T. Lt Green's B-17 hit B-17G 44-6600 (no name) (359BS) BN-B, piloted by 1Lt Andy R. Virag, damaging the right wing and knocking off the right aileron. Lt Virag was unable to maintain altitude and keep up with the formation. It was hit by fire from a German ME-109 and Lt Virag ordered his crew to bail out. All became POWs. 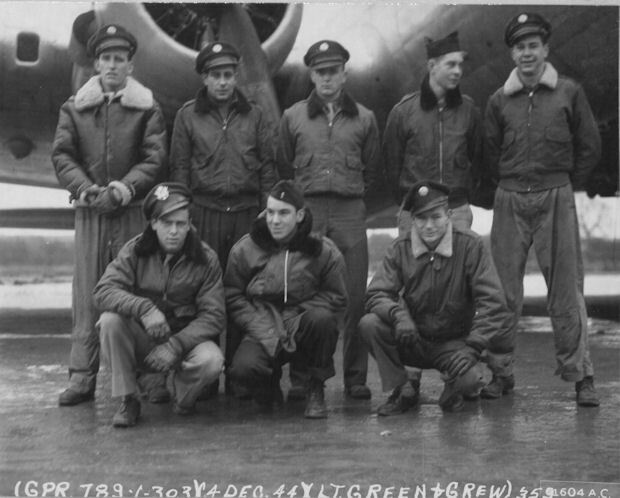 2Lt James F. Green (P) - Flew no more 303rd BG(H) combat missions after the 21 Nov 1944�miission #275.� Lt Green refused to fly any additional combat missions while being admonished by� Major William C. Heller, 359BS Operations Officer.� He was relieved of flight duty and his�crew was broken up and flew with other Pilots. 2Lt Harold L. Fravel (CP) - Flew 11 more missions as CoPilot with 6 different Pilots. Was upgraded from CoPilot to Pilot on 3 Jan 1945 and flew 18 mission as Pilot. Combat tour completed on 17 March 1945. 2Lt Louis T. Gennaro (N) - Stood down after mission #275 and underwent training as a Mickey Navigator. Resumed combat missions with mission #299, 8 Jan 1945, and flew 21 missions as a Lead Crew Mickey Navigator with a number of different 359th BS Lead Crew Pilots. 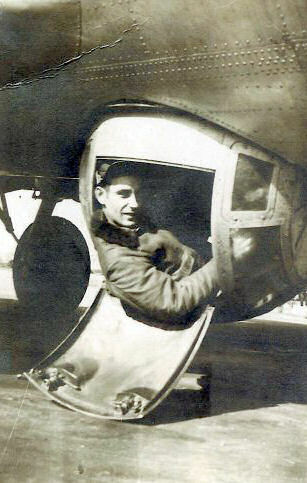 S/Sgt Ruben W. Belcher (E) - Flew 17 additional missions with ten different Pilots - six with the Lt Cecil L. Gates Crew. Last mission (363) on 20 April 1945. Did not complete his 35 mission combat tour. S/Sgt Bruce H. Hinnershots (R) - Replaced original crewman Sgt Dale G. Reese who became a member of the Lt Kenneth E. Bixby crew. Flew 4 additional missions with 4 different Pilots (284, 290, 304, 305). Was Killed on action on mission #305, 21 Jan 1945, to Aschaffenburg, Germany, in B-17G #42-97058 Scorchy II (359BS) BN-V, 2Lt Richard F. Tasker Pilot. 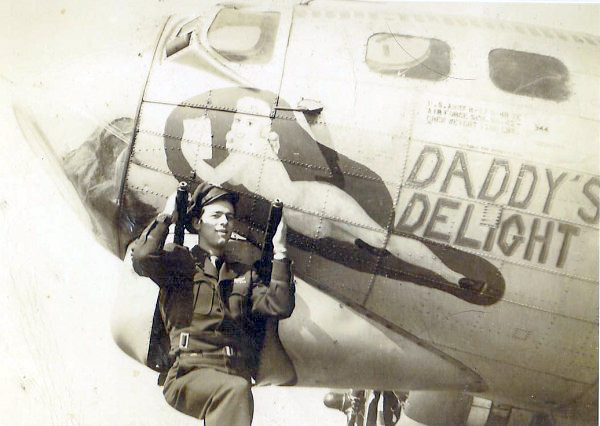 Sgt Lawrence E. Schilling (BTG) - Flew 28 additional missions with 12 different Pilots- 12 with the Cecil L. Gates crew. 35 mission combat tour completed on 19 March 1945. Sgt James B. Roberts (WG) - Flew six missions with the Lt Green crew as Togglier. Flew 25 additional missions as Togglier or Tail Gunner with 17 different Pilots. Last mission (363) on 20 April 1945. Did not complete his 35 mission combat tour. Sgt Howard D. Schoonover (WG) - Was not an original member of the Lt Green Crew - Replaced Sgt Mondo Lombardi who became a member of the Lt Kenneth E. Bixby crew. Flew additional missions with 18 other Pilots as Waist Gunner or Tail Gunner. Combat tour completed on mission 362 on 17 April 1945. Sgt Delbert Foster (TG) - Flew on one additional mission (284) on 9 Dec 1944 with another Pilot. Sgt Mondo Lombardi (WG) - Replaced on the Lt Green crew by Sgt Howard D. Schoonover (WG). Flew on 10 missions with the Lt Kenneth E. Bixby crew. Sgt Dale G. Reese (BTG) - Replaced on the Lt Green crew by Sgt Bruce H. Hinnershots (R). 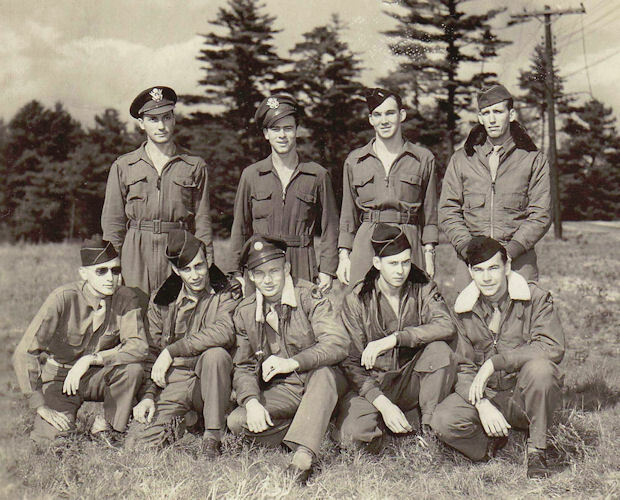 Sgt Lawrence E. Schilling became Ball Turret Gunner. 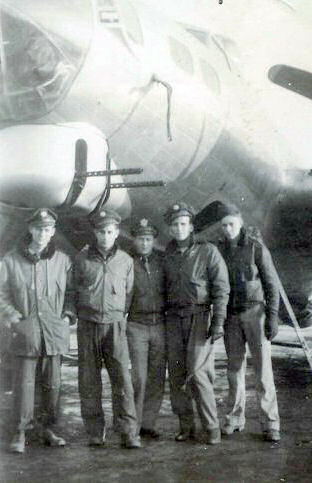 Sgt Reese was dispatched on 37 missions with the Lt Kenneth E. Bixby crew. 35 mission combat tour completed on 10 March 1945.